I get asked a lot about what is "clean eating." Basically it is eating as close as possible to mother nature, and choosing the right foods for your body. I usually get the excuse "but eating healthy is so expensive." Well, it isn't really and how much is your health worth to you?? 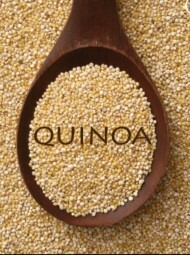 Here are some benefits and recipes of quinoa. This is an inexpensive clean eating item that is very versatile, family and gluten free friendly!! Give it a try!! GOOD SOURCE OF CALCIUM HELPING BONES, TEETH, HEART, NERVE AND MUSCLE FUNCTION.